KoopaTV: Whatever the hell a Beyoncé is, keep it away from Nintendo! Whatever the hell a Beyoncé is, keep it away from Nintendo! By LUDWIG VON KOOPA - I DON'T want Nintendo experimenting like this. Since you're on KoopaTV to begin with, you probably don't value your own sanity that highly. Still, I'll try my best to describe what happened: In some apparent advertisement for Just Dance 2018 (and the game-streaming subscription service, Just Dance Unlimited), Nintendo and Ubisoft made and/or approved of a terrifying video of the #SASSY #NOFILTER Rabbid Peach from that awful Mario + Rabbids Kingdom Battle game that should've never progressed past being FAKE NEWS. 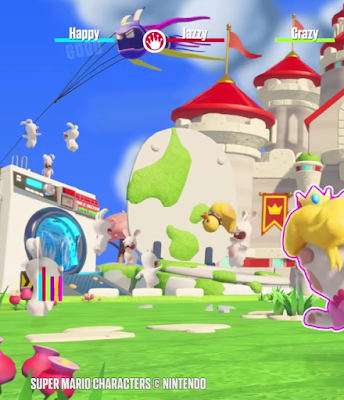 As you might expect for an advertisement for a bad dancing game, it's Rabbid Peach dancing to music I've never heard of. Apparently, it's from something called a “Beyoncé”, and that entity is quite popular on Earth. It's totally unknown to me why, because its song is atrocious to listen to. Frustratingly, Rabbid Peach, along with a slew of other Rabbids, are all hanging out in front of the real Princess's castle. They're not being evicted. No one is even trying to get rid of them. You think the Mushroom Kingdom people would treat Koopas so welcomingly? Nope. But creepy alien rabbits are just fine for them? with the Bowser-style collar from Ubisoft's E3 2017. I have a big problem with the de-valuing of Nintendo intellectual property, especially when it involves my planet having to deal with creepy crap like this. These Rabbids are worse than Earth's refugee invasion hordes. They're bringing their “Beyoncé” culture here while spreading hideousness and misery, and as you might expect will never become productive, working members of society. They're bringing drugs. They're bringing crime. They're Rabbids. When they can do whatever they please to Mario, that also means they can do whatever they want to ME. I have a big problem with that. Soon they'll be dancing to whatever a “Kendrick Lamar” is in front of King Bowser's castle! If you want good singing and not whatever a Beyoncé is, go play Soviet Missile Run. It features Ludwig singing a full song as early as the title screen if you wait a few seconds! It later re-appears in three further versions in the final boss fight, and then again in the credits! In the meantime, comment if you feel bad for Koopa Kingdom's woes. Not all female alien rabbits are creepy or even unlikable. Compare Rabbid Peach to the beautiful Broodal, Hariet! I have honestly no idea who still plays these Just Dance games. After you have played one, it is like you have played them all. The only difference is the song selection which usually features years old pop music, a genre that I could not care less about. Adding Rabbids to the game is only going to deter more people from buying it. Millions of people, I think. That's why Ubisoft is moving Just Dance to a subscription streaming service rather than an annual release schedule. My mother wanted a Just Dance game. I got it and then she never cared about it again.